Android lovers rejoice – because Samsung unpacked one of their most impressive devices yet at Mobile World Congress: the Samsung Galaxy S9 and S9+. Better yet, it’s available to buy now on a Red Plan with Vodafone. Among its many exciting features, the Samsung Galaxy S9 has completely redefined the smartphone camera – designed for a social media generation. The Samsung Galaxy S9’s camera reimagines the technology of a smartphone camera, featuring a dual aperture that adapts, just like the human eye. This allows the device to take stunning pictures in any light from bright daylight to moonlight – a challenge for many other smartphones. It features a 60% improvement in low-light photography, thanks to the dual aperture system, and a new Live Focus background effect that sharpens the foreground. The Samsung Galaxy S9’s camera allows you to slow down a moment to 960 frames per second, so you can capture even the most minute details, and you won’t miss a thing! It even lets you loop moments, add music, and share to social media instantly. Want to truly personalise your messages? You can’t get much more unique than using the camera to turn yourself into an emoji using AR technology. Your AR Emoji even has animated reactions that will channel your digital personality! No need to learn a new language for your next trip overseas – just use Bixby Live Translation to help you get around. The Samsung Galaxy S9’s camera allows you to translate signs from different languages, so you’ll always be on the right track. 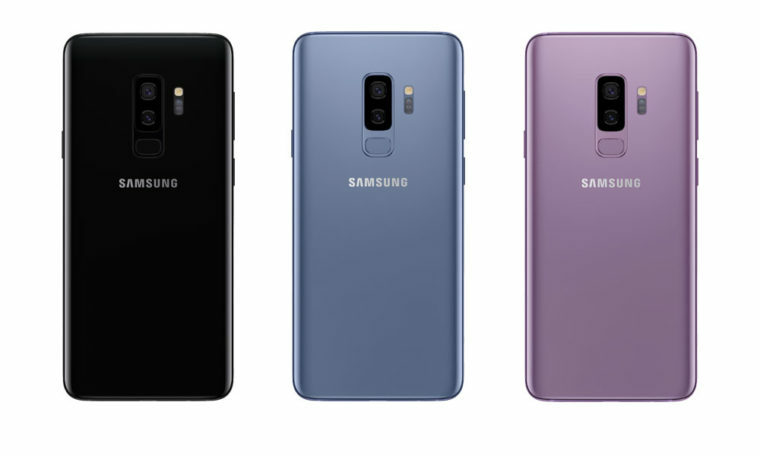 Colour is a first for the Galaxy – and while black is a timeless classic, we’re excited about the Samsung Galaxy S9’s new colour palette. You can choose lilac or blue (or black of course), to add a new splash of personality to your phone. Plus, you can personalise your phone even further with a Video Wallpaper! You can adjust your phone to high security mode and open your phone using facial recognition – the camera recognises you instantly. Now no one can snoop around your phone! Control your camera with a simple voice command – so you can capture that perfect selfie without any button pressing to get in the way. The Samsung Galaxy S9 is the fastest Galaxy yet, and even more durable. Plus, the device is water-resistant with an IP68 rating (based on test conditions for submersion in up to 5 feet of freshwater for up to 30 minutes) – so you can really make a splash. The device’s stereo speakers are tuned by AKG and offer pure sound that’s 1.4 times more powerful than previous Galaxy phones. You can even share your phone screen to any other Samsung screen (such as your Samsung TV), hassle free. While the dimensions of the Samsung Galaxy S9 have decreased, the screen coverage has increased, allowing you to see more, but hold less. The screen is designed for a generation of content creators – with an uninterrupted canvas. The Samsung Galaxy S9 and S9+ are available to order on a Red Plan now with Vodafone. Must connect for minimum one month. Total minimum cost is one month of your plan fees plus 100% of the RRP of your chosen device. There is no Early Exit Fee on your Red Plan, however, if you choose to cancel your Red Plan, 100% of the remaining handset instalments will be applied to your next bill (you cannot have an MPP without an active Red Plan). Recurring monthly plan fee charged until the end of the month in which you notify that you wish to cancel. If you have more than one Vodafone plan that supports sharing on your billing account, the data allowances on those services will automatically combine into one pool which will be shared between eligible users (data sharing is only available on up to 10 services, a maximum of 5 of which can be voice plans). Any existing international calling allowances on your account are not shareable with this plan. You can find out which plans support sharing or you can opt-out of sharing altogether at any time by calling 1555. Mobile Payment Plan (‘MPP’) available for personal use only to approved customers who simultaneously connect (and remain connected to) an active and eligible Vodafone Red plan. The outright price of your chosen device (as set by Vodafone at the time of purchase) will be spread in equal instalments over your chosen commitment period (12, 24 or 36 months). Once selected, this commitment period is fixed (unless you elect to pay your total remaining balance in full in one installment). If during your MPP commitment period you cancel your Red Plan, your MPP will also be automatically cancelled and 100% of remaining MPP instalments plus outstanding charges on your voice plan will be applied to your next bill. Personal use only. Business customers must have an ABN/ACN. Samsung Wireless Charger Convertible (‘Gift) available to customers who sign up to a Red Plan with a Samsung Galaxy S9 or S9+ on Mobile Payment Plan (‘MPP’) by 15/03/2018. Max 1 Gift per customer per purchase. Max 1 gift per business customer on up to 5 purchases. Not for commercial/resale purposes or exchangeable/redeemable for cash. Subject to change. To the extent permitted by law, Vodafone is not liable for any loss, damage, or personal injury suffered or sustained in connection with using the Gift. Red Plan and MPP terms apply.